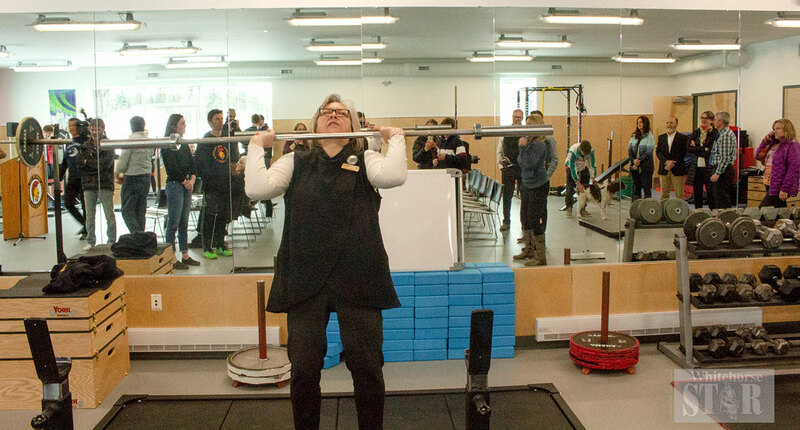 PUMPING IRON – Minister of Education Tracy-Anne McPhee demonstrates her weight lifting form at the new F.H. Collins weight lifting and exercise facility on Thursday. F.H. Collins Secondary School students will get to enjoy a new weight lifting and exercise facility which features competition grade equipment. F.H. Collins Secondary School students will get to enjoy a new weight lifting and exercise facility which features competition grade equipment. Minister of Education Tracy-Anne McPhee announced the opening of the new athletic facility on Thursday. The new facility is intended to help students learn more broadly about fundamental movement skills and overall physical development - a focus of the school’s sports program. The one-storey 246-square metre (2647-square foot) building sits a short walk behind the school. It has space for 27 students. The existing fitness room at the school will continue to be available. The new space will be focused on learning opportunities for students interested in sports programming, physical development, and health and well-being. Whitehorse Olympian, and former F.H. Collins student, Jeane Lassen said hopefully the new facility will be named after the late Jamie Shaw. “The weight room is much than a place for F.H. Collins students, present and future to become faster, stronger and more agile,” said Lassen in her speech. “It is also a place to connect with others and will hopefully soon be named the Jamie Shaw High Performance Centre. The sports program emphasizes mastering fundamental movement skills and overall physical development in students, whether they already consider themselves athletes or whether they are simply interested in enhancing their physical fitness. Grade 11 student, Liam Russell, spoke about his experiences in the old weight room and looked forward to using the new facility. Grade 12 student, Fionnuala Marion, helps coach in the weight room. She said all of the programming will be able to take place in the new facility. She hopes it draws new students to the weight room. Superintendent for F.H., David Wipf said it is an important facility for the school to encourage lifelong learners. “It is a highly meaningful thing because it fills a niche for the school,” said Wipf. “This is a facility that is open to all students, regardless if you are a high-performance athlete or not. What we want are students who are going to be lifelong learners and active lifelong learners. As the formalities of the afternoon came to an end students in the sports school program demonstrated their weight lifting techniques to the crowd. Marion even taught McPhee how to properly lift while a crowd looked on.